What was the area called before its incorporation? Unincorporated Hennepin County? Richfield Township? Minneapolis Township? A little of each? Here are some relevant facts, some of which seem to contradict each other. Minnesota became a territory of the United States in 1849. On March 6, 1852, the Territorial Legislature granted permission to formally establish the boundaries of Hennepin County. Previously, the area had been in Dakota County. In 1853 a treaty between the Sioux and President Millard Fillmore gave clear title and possession of the land to the United States. The 15-section area that includes present-day St. Louis Park was surveyed in 1854 in anticipation of opening it up to private ownership. Although settlers couldn’t buy property there before this happened, they had staked their claims in anticipation of the survey. On May 16, 1855, 15 sections of Hennepin County were subdivided into what became part of St. Louis Park, designated as township 117, Range 21. Richfield Township was created in April 1858, and included the part of St. Louis Park south of Minnetonka Blvd. Richfield Township covered 63 square miles. Surveyors in 1854 noted that most if not all of what would become Richfield Township had already been claimed, and some improved. The Board of County Commissioners established Minneapolis Township on April 10, 1858. This area included the section of St. Louis Park north of Minnetonka Blvd. Minnesota achieved statehood on May 11, 1858. The State Legislature wanted to give the name Brighton to the area outside the Minneapolis city limits, but in response to objections, the name Minneapolis Township was restored on March 7, 1867. 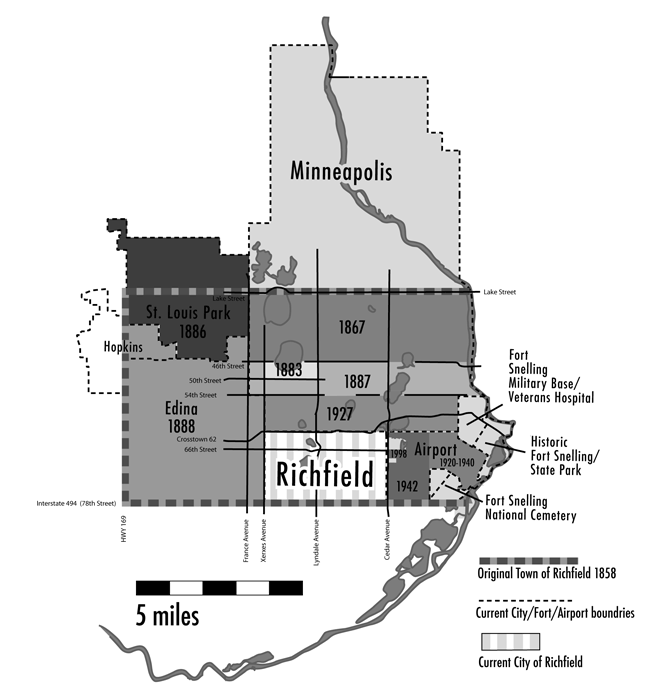 On March 7, 1867, the two northern tiers of Richfield Township were added to Minneapolis Township. This applied to the southern section of Minneapolis, but unclear whether it included the section of St. Louis Park south of Minnetonka Blvd. A 1874 map shows that the section of St. Louis Park south of Minnetonka Blvd. was still in Richfield Township. Articles in the Minneapolis Tribune before 1886 refer to places and people who were clearly part of the present-day St. Louis Park as being in the Township of Minneapolis or Minneapolis Township. This is not to be confused with a very large subdivision of Minneapolis proper which is also called “Town of Minneapolis” and was probably recorded in 1854. The St. Louis Park Land and Improvement Co. was incorporated in 1886. Incorporation papers list five men from Minneapolis and O.K. Earle and Joseph Hamilton (who lived in present-day SLP south of Minnetonka Blvd.) from Minneapolis Township. St. Louis Park was incorporated as a village in December 1886.